1st Quarter: (KP) Brendan Lydon 5 yard rush, XP blocked. 2nd Quarter: (BR) Bryce Shaw 33 yard rush, George Lampros XP good; (KP) John DeLuca 12 yard rush, Shane Frommer 2pt rush. 3rd Quarter: (BR) Shawn Noel Jr. 62 yard rush, G. Lampros XP good; (KP) S. Frommer 5 yard rush, Cole Baker XP good; (BR) S. Noel Jr. 30 yard rush, G. Lampros XP good. 4th Quarter: (KP) S. Frommer 4 yard rush, XP blocked; (KP) B. Lydon 1 yard rush, 2pt failed; (BR) Corey Sullivan 23 yard pass to S. Noel Jr, XP good. 1st Quarter: (D) Bobby Maimaron 1-yard rush, XP blocked. 2nd Quarter: (D) B. Maimaron 3-yard pass to James Miele, 2-point conv. no good; (NA) Chad Peterson 30-yard pass to Kyle McCarthy, Geoff Wilson XP good. 3rd Quarter: (D) B. Maimaron 3-yard pass to Ryan Reagan, Liam O’Donovan XP good. 4th Quarter: (D) B. Maimaron 11-yard pass to R. Reagan, L. O’Donovan XP good; (NA) C. Peterson 36-yard pass to David Engler, XP blocked; (NA) C. Peterson 25-yard pass to Mario Bresko, XP blocked. 1st Quarter: (F) Mark Clagg 25 yard pass to Trey Guerrini, XP good; (OA) Liston Funai 4 yard rush, XP good; (F) M. Clagg 22 yard pass to Jamaine Few, XP failed. 2nd Quarter: (F) Mike Luong 1 yard rush, 2pt failed; (F) M. Clagg 4 yard pass to J. Few, XP good. 4th Quarter: (OA) Curtis Cann 25 yard pass to Dean Pacini, Leandro Moro 2pt rush; (F) T. Guerrini 16 yard rush, XP good. 1st Quarter: (M) Joe Cox 5 yard rush, Diogo DeSousa XP good; (M) Nick Graham 5 yard rush, D. DeSousa XP good. 2nd Quarter: (M) Anthony DeGirolamo 45 yard pass to Mike Shannon, D. DeSousa XP; (N) Max Sylvia 15 yard pass to John Andre, XP failed. 3rd Quarter: (M) J. Cox 81 yard rush, D. DeSousa XP good. 4th Quarter: (M) Will Garvin 5 yard rush, D. DeSousa XP good. 2nd Quarter: (D) Cole Jacobsen 5 yard rush, XP failed; (S) Justin Ly 6 yard rush, 2pt failed. Overtime: (D) C. Jacobsen 10 yard pass to Liam Caulfield, L. Caulfield XP good; (S) Ryan Sullivan 6 yard rush, R. Sullivan 2pt rush. NORTH EASTON, Mass. – With a chance to secure a home playoff game, Mansfield was able to execute in all facets of the game in a convincing 41-6 win over Oliver Ames on Saturday. It was the first meeting between the two teams since 2011. 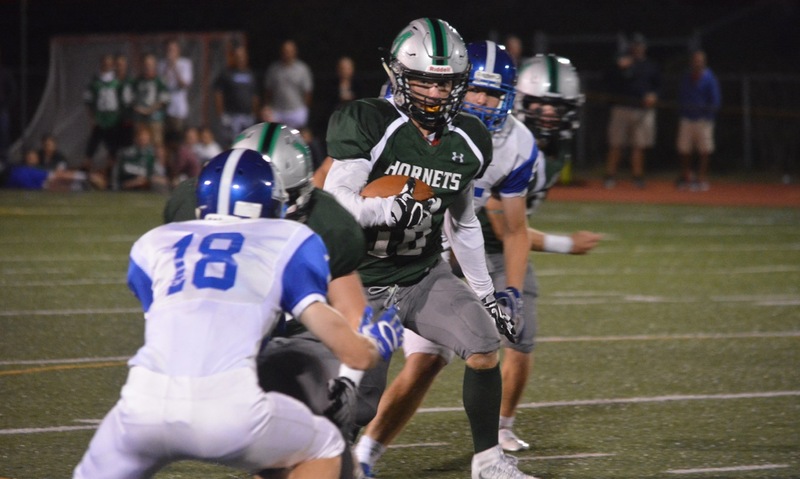 After having to punt on the opening drive, the Hornets scored a touchdown on the next three series, and then three of the next five to get the win and in all likelihood, lock up the fourth seed in the Division 1A South. “The big thing is to keep playing at a high level,” Mansfield head coach Mike Redding said. “We played well last week. We wanted to get out of this healthy and get the home – I think we did everything we wanted to. I think we secured a home game, we’ll see how the math works out but I think we have some confidence and momentum going into the playoffs. Both the Hornets and the Tigers had to punt on the opening drive but Mansfield made quick work of its second offensive series. A 15 yard pass from Anthony DeGirolamo (6/11, 100 yards) to Hunter Ferreira (two catches, 31 yards) preceded an 18 yard run from Nick Graham (five carries, 47 yards). On the third play of the drive, DeGirolamo found Mike Shannon up the middle for a 33 yard touchdown. A high snap forced DeGirolamo to attempt a pass for a two-point conversion but the catch was deemed out of bounds, giving Mansfield a 6-0 lead. Oliver Ames’ next five drives resulted in a turnover on downs and four punts. On Mansfield’s third drive, Joe Cox (77 yards) busted free for a 28 yard gain on the first play. On the second play, Graham went nearly untouched through the right side for a 22 yard score and a 13-0 lead. The Hornets used their longest drive of the game, spanning the end of the first quarter and beginning of the second quarter to get their third touchdown. Mansfield used seven plays to cover 76 yards to expand its advantage over the Tigers. Highlighted by DeGirolamo completions to Kristian Conner (13 yards) and Ferreira (16 yards) and a 26 yard rush from Will Garvin, Mansfield pushed the lead to 20-0. DeGirolamo used an option on a jet sweep to take it in himself for a 12 yard score. Mansfield added two more touchdowns before the first half came to a close. Cox rattled off a 49 yard touchdown run with 3:35 left in the second quarter and then DeGirolamo found sophomore Aidan Sacco for a 14 yard score with just over 30 seconds to play in the half. Oliver Ames had its best drive of the game to open the second half. 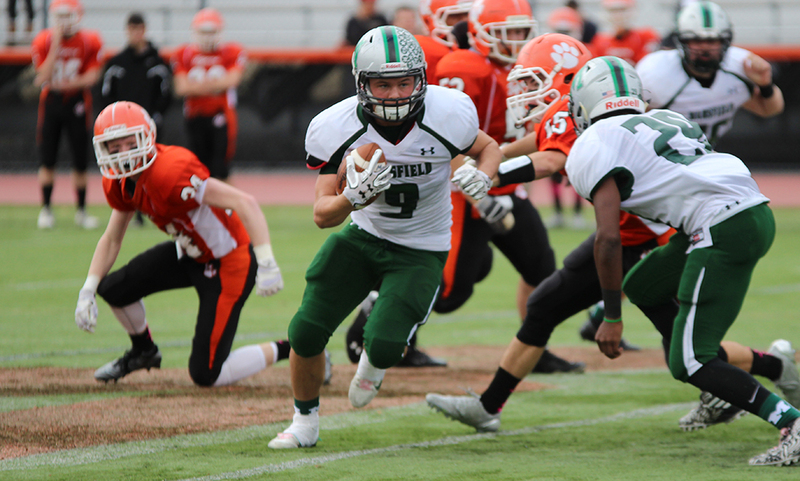 Sophomore Anthony Berksza (163 all-purpose yards) got things started with a 54 yard kickoff return and then hauled in a 32 yard pass from Kyle Gagliardi to help the Tigers move the ball up the field. Liston Funai punched it in from a yard out for OA’s touchdown and Berksza fought his way in for a two-point conversion. The Hornets’ final touchdown came in the third quarter with Sacco running it in from 12 yards out. Mansfield, which is 5-2 overall, will likely host Marshfield next Friday based on The Boston Herald’s ratings. Official seeds and matchups will be announced by the MIAA on Sunday. Oliver Ames (2-5) will miss out on the playoffs and will find out their next opponents on Sunday as well. WRENTHAM, Mass. 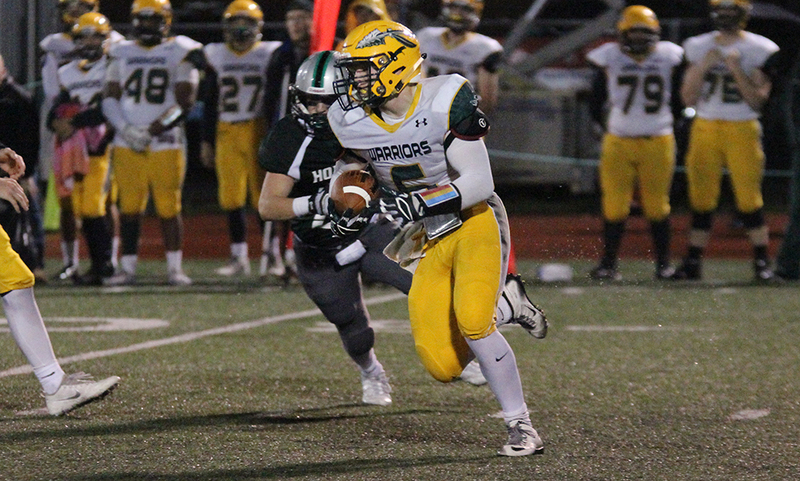 – King Philip head coach Brian Lee would be the first to tell you the Warriors’ offense isn’t typically flashy, but in a crucial division showdown on the road at Mansfield, sometimes you need to add some flare. Lee did just that, picking the perfect time to reach into KP’s bag of tricks. Trailing 17-14 with nine minutes to play in the game, quarterback Brendan Lyon tossed to his right to Sean Garrity, but instead of taking the ball around the edge, Garrity tossed it back to an oncoming John DeLuca on a reverse. DeLuca went on to break a couple of tackles downfield – one with the help of receiver Michael Mello – before finally being tackled at the 4 yard line – a 61 yard gain. Two plays later, Lydon (3/10, 77 yards; 5 carries 17 yards) snuck it in from a yard out to put KP ahead. The Warriors defense did its job, forcing a three and out on Mansfield’s ensuring drive and stopping the Hornets on fourth down with just over two minutes to play to secure a 20-17 win at Alumni Field. The Hornets looked like they might pull back ahead on their final drive of the game. Anthony DeGirolamo connected with Hunter Ferreira for 24 yards on first down to move the ball to midfield. Two plays later, a double move from Ferreira put him open towards the end zone, but the throw just missed as Ferreira could only get one hand on the ball before it fell incomplete. On fourth and 6 from their own 46, DeGirolamo dropped back to pass but the Warriors brought heavy pressure. Shane Frommer came from DeGirolamo’s right, forcing him to move in the pocket and Alex Olsen and Brett Mazur came crashing in for the sack and the turnover on downs. KP converted a fourth and inches from the Mansfield 38 yard line with just over a minute to seal the win. After trading punts to open the game, DeGirolamo hit Will Garvin for a 27 yard gain to get inside the KP 10 yard line. The Warriors’ defense held on though and Mansfield settled for a 20-yard field goal from Diogo DeSousa to go up 3-0. The Warriors forced Mansfield to punt on their next drive but King Philip senior Ethan Dunne came flying in untouched to block the kick. King Philip took over at the Mansfield 21 yard line. It looked as though Mansfield’s defense had stopped KP despite the good field position, but the Warriors earned a defensive pass interference call on 4th and 19 from the 30 yard line. Two plays later, Lydon hit Garrity (15 carries, 58 yards) on a screen for a 25 yard touchdown and a 7-3 lead. Mansfield worked up the field for a 44 yard field goal attempt just before halftime but it appeared the Warriors got a hand on the kick and it fell short. It didn’t take long for Mansfield to regain the lead in the second half, cashing in on its first drive. On just the third play, Hornet back Nick Graham (19 carries, 124 yards) got a nice block from fellow backJoe Cox, cut back into some space and sprinted for a 50 yard touchdown to put Mansfield up 10-7. KP responded right away to tilt the game back in their favor. Lydon hit Dunne on third down for a big 39 yard gain. Four plays later, Olsen (8 carries, 27 yards) plunged up the middle for a 2 yard touchdown to make it 14-10 with 5:37 left in the third quarter. The seesaw battle continued with Mansfield landing a counter punch on its next drive. Facing 3rd and 5 from their own 34, DeGirolamo (5/12, 132 yards) used play action and then found a wide open Ferreira (3 catches, 105 yards) in space for a 66 yard touchdown, making it 17-14 with 2:17 left in the third. The Warriors started the fourth quarter with a big play, converting a 4th and 1 from their own 30 yard line with a Lydon sneak. Three plays later is when Lee elected to go with the reverse for DeLuca’s big run. The extra point following Lydon’s sneak was short, opening the door for Mansfield with a three point deficit and foot of DeSousa available. But KP’s defense held Mansfield on the ensuing drive, forcing a punt. Mansfield’s defense did the same as the time ticked away in the fourth quarter. That set up Mansfield’s fourth down attempt that was shut down by Olsen and Mazur’s sack. The win puts King Philip in the driver’s seat in the Kelley-Rex division. Although it was Mansfield’s second loss of the season, it was the first in terms of the playoff system. “Now we have to bang out the next three and get ready for the playoffs. Maybe [KP] finishes the one seed and we finish the second seed and maybe we play again, maybe the finals or the semifinals. I think that’s the focus now. We have three games to bang out wins and then lined up ready to go. King Philip football (4-0, 2-0) will return to Macktaz Field next Friday with a visit from Thanksgiving rival Franklin. Mansfield (2-2, 1-1) will take a trip to Aleixo Stadium to take on the Tigers on the same day.